Our range of Electro Magnetic Closers is designed for a variety of door widths and weights. A popular product is the Freedor Free Swing Battery Powered Fire Door Closer, which is designed for heavier doors, reduces risk of injury, improves ventilation and has a battery life of 18 months. These mechanisms are the electromagnetic variation of the traditional door closer, ideal for fire rated doors, which can either be held open or free to swing during daily use. In the event of a fire, the door will automatically close, as it is connected to the fire alarm system, stopping the spread of smoke and fire. Its hold-open or swing-free feature is required in high traffic areas, such as commercial or public buildings, ensuring easy access and circulation. This versatile solution for legally controlling fire doors is a strong and durable product. Our high-quality electromagnetic closers are non-handed for maximum flexibility, being suitable for left-handed and right-handed applications. 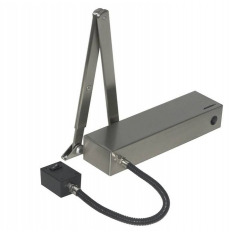 Our range of electronic magnetic closers are available in silver and satin stainless finishes. We stock a range of closers for various fire safety door sizes and weights, these include light duty door closers, medium duty door closers and heavy-duty door closers. If you need more information on electro magnetic door closers, please contact our friendly and knowledgeable sales team at Ironmongery Experts.